This was EXACTLY the steps I needed to solve my problem yesterday. Your steps worked like a charm, and my mother's day card turned out great. Thanks so much! Have you ever had trouble seeing your previous .svg to .dxf files in silhouette? Mine were working great. Now all of a sudden the dxf files are blank when I open them in silhouette! Do you have any advice or things I should look for. They are simple vectors. No layers or groups or compound paths. Linda, I have seen this on occasion. The usual problem is that my objects are filled but the lines are blank. That doesn't always seem to work when importing to Silhouette. I also try to make sure there are not multiple art-boards for the shape. Sometimes if it's really giving me problems I cut and paste each shape individually into a new file. I hope this helps. Hello Maggie, do you have a formula when you export from illustrator, in artwork scale, so that when you import it in to SS it is the right size you want to cut; or you just scale it somehow. That would be great to know. Thanks! Hi G. I have no formula. I just resize it once I open it in SS. I just show the grid behind the image to make it perfect! in Illustrator CS6 go to File/Export and save as DXF. 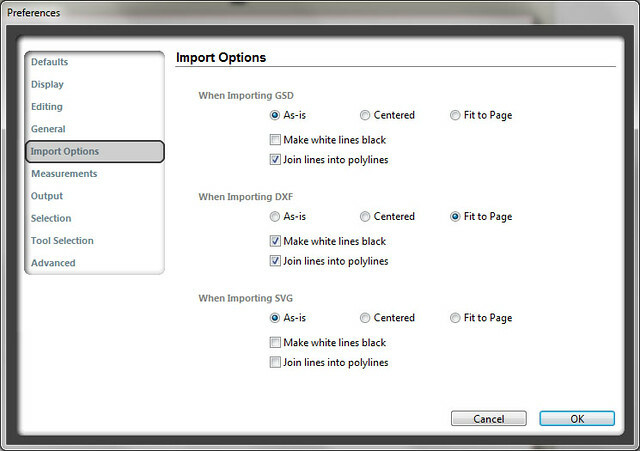 In the dialog select 2004/2005/2006 version. Set scale to "1 millimeter = 1 Unit". Enable the "Maximum editability" option and hit Ok. In Silhouette Studio go to File/Preferences/Import Options and set DXF to "Centered". Now open the DXF in Studio and it should be at the right scale. Just got my Cameo and haven't even turned it on yet! Looking forward to doing a test cut of my newly exported DXF! None of these worked for me.. The only way I can get it to show up in Studio is to do a stroke path. If I export with no fill/no stroke, nothing shows up. Has anyone else had the problem when they import a .dxf file, extra lines are added? Basically when I import a dxf file, the original lines are altered i.e. when I import a standard box into my silhouette library, the boxes corners are shaved off slightly so I am no longer left with 90 degree corners at the very tip. The lines aren't precise like they were when I exported from illustrator. Ive reopened the files to check that saving them wasn't the problem and they load in illustrator as they should. I guess silhouette studio doesn't care to be that precise or something? What i'll do is to set the import to As-is and leave the rest untouch and on illustrator, export the dxf file and set the AutoCAD version to R14/LT98/LT97. It will open in the silhouette studio to the exact size as per your design. Hope it helps! then i want to print it using Silhouette Studio but i faced problems with dimension. Has anyone has issues with exporting as a .dxf from illustrator and silhouette studio acts like it is opening but loads up to 99% then says that the file isnt supported? Opening exported SVG from illustrator. Followed all directions. No compound paths, groups etc. Just outlines. When opening the SVG in Silhouette Studio Designer Edition 3.6.57ssde i get the error "the file type you are attempting to access is not supported." What does this mean? When importing a .dxf to Silhouette and it almost completes but then says the file type is wrong - you may need to check the file for groups, compound images and layers. Removing all of them is what usually fixes that for me. Has anyone else had the problem of lines that are perfectly smooth in Illustrator coming into SS "flattened" a bit? Looking at certain curves where i have used a single point for example, I will see 5 or 6 points which are connected by straight lines rather than a smooth curve. Jeff - this actually sounds familiar but it's been a while since I've imported a file. I often use the plugin to cut directly from Illustrator. I would check for compound paths first - that's usually my problem. Or possibly simplify the path in Illustrator and try exporting again. Sorry I'm not as helpful this time.